Lucky thief is a three-piece art group who live and work in Stockholm, Sweden. The production stretches from paintings and wooden sculptures to installations and video, and the group is right now expanding their field Into architecture and new media. __Seeing art as a collective action, they work on the same paintings and sculptures at the same time, adopting the creative climate from band rehearsal sessions. LuckyThief believe that the more irreverent, free and boundless the cooperation is, the more unexpected and exciting the end result gets. 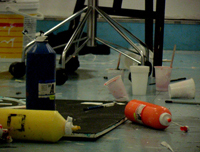 In this creative, and sometimes destructive chaos, no work is sacred. Sculptures an paintings are carved out and painted, torn apart, rearranged and converted in a prolonged and ruthless process. __The style is a blend of modern and ancient culture. Some find hints of vodou and primitive totems in the works of LuckyThief, while others point out the influences of today's bubbling visual culture. By seamlessly moving between different art worlds and contexts, through partnerships with other artists, musicians, moviemakers (and soon also a dance group), they are questioning the distinctions between different fields and thereby challenges both themselves and all others. But even if the universe in which the group is dwelling may seem dreamy and utopian, we must remember that LuckyThief do not turn a blind eye to the world, but instead actively participate in it. It can happen on the streets, in galleries, in old industrial buildings, in forgotten places deep in the urban landscape or in nature at the edges of our cities. Curiosity and discovery drives LuckyThief, and those of us who want to follow them, away from the boredom of the present day and out on a real hunt for a fairer, braver and more beautiful world.